I’ve been working hard on producing elements of the Leeds International Artist Book Fair, so much so, that I didn’t even have time to organise my own stall. So I was very happy to hear that the proposal for my book for the AMBruno stall has been accepted. AMBruno are primarily a London-based collective who aims are to ‘represent current artistic thought, practice and sensibility translated and expanded into book art form’. Having worked with them previously for shows at the Whitechapel Gallery, London and LAB Gallery, New York, I’m excited to be involved with their new project, the brief for which is ‘16’. The group often participate in artist book fairs nationally and internationally, but instead of asking their members to provide their latest work to show, the stall is curated around a theme. This has the effect of bringing together a coherent body of work on the stall, whilst also encouraging the production of new work for each exhibition. As I’m attempting to focus much of the work I’m producing around my main research question (the function of the work of art), I decided to use this as a starting point for how I would approach the brief. My inspiration came as I was listening to a presentation on the meaning and function of Islamic magic squares at the Charming Intentions conference in Cambridge (from week 12). I started to consider the ‘magical’ properties of flexagons, how previously unseen pages appear through folding the page in different directions. 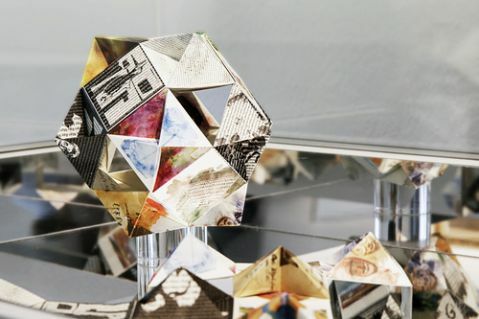 A square panel book, based on a flexagon design, could unfold to reveal one of four pages, each made up of four sections, totalling 16 sections altogether. However, although I had now chosen the form that the book would take, I was still unsure about its contents. Given that the magic square often has ritual as well as mathematical connotations, I decided to consider its application within visual culture. The image of the magic square in Albrecht Dürer’s ‘Melancholia I’ is one of the first examples in European art, and has been interpreted as being rich in alchemical symbolism. The title of the work relates to one of the four temperaments (melancholic, phlegmatic, choleric, and sanguine). These were linked in the medieval mind with the four humors (black bile, phlegm, yellow bile, blood), as well as the four elements (earth, air, fire, water) and the colours which represented the four stages of alchemy (black, white, citrine, red). 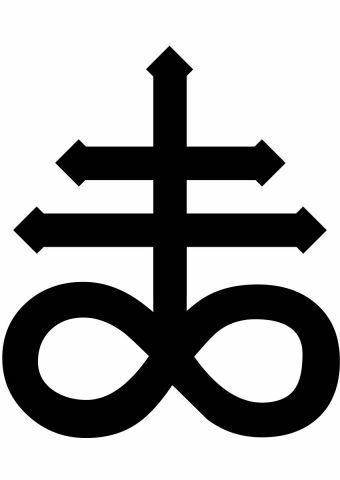 Yet another search revealed that sulphur (or brimstone), one of the three cardinal principles of alchemy, also has the atomic number 16, connecting alchemy and the elements back to the original brief. Through creating pseudo-museological objects, which explore the apotropaic principles of puzzles, patterns and numbers (among other things), the work also relates back to the agency of the object, and how it functions within society. Although the mixing of alchemical, hermetic and religious imagery may be detrimental to the understanding of the original source material, the purpose is to highlight the relevance of context when viewing artworks. This can occur when curating art and artefacts in museum settings, where new relationships between artworks and their respective audiences are created, thereby developing new interpretations. It’s the first full week back at uni and term has started with a vengeance. I thought I had a relatively quiet week to start the year, but when I looked at my diary, I realised I had 2 meetings and a workshop booked. This, in addition to my studio practice and steadily increasing reading list. The first meeting was about the Artist Book Fair, due to happen on 8th – 9th March. The project is organised by my supervisor Chris Taylor and his colleague John McDowall, and is a fantastic opportunity for book artists from all over the world to show and sell their wares. I’ve previously organised events alongside the fair as part of the wider exhibition programme, by inviting artists from my online group Artist Book Collective to submit to exhibitions and opportunities. Given that many of my events have been organised and galvanised through the use of social media, Chris thought it would be an excellent opportunity to apply this to the fair as a whole, so I’m currently in the process of building a website and collating the archive of 15 years of book arts activity in Leeds. My second meeting was with the Marks & Spencer archive who I’d paid a visit to last year for a seminar on using archives in research-led teaching, and I’d discussed the possibility of developing interpretation workshops and exhibitions with them. I gave them a bit of background to my interests and experience and we agreed that it was something that we’d like to develop as an idea, perhaps drawing connections between artistic and commercial developments in Britain in the 20th century. My preferred style of working is very reflexive, developing programmes in response to the participants ideas and requirements, and adding my own knowledge and experience when appropriate. This first came about through training with Creative Partnerships and continuing to work in gallery programmes like Tate Britain’s Visual Dialogues, so I used this as an example of the kind of thing I’d be interested in producing. We agreed that I’d put something down in writing, but I decided to do a bit of a Google search to see if there was already info online about my previous projects. I was amazed and happy to learn not only that there was, but also that it was part of a gallery curriculum to provide teachers with lesson plans to engage their students with contemporary artworks. The week ended with a booster workshop designed to help with maintaining motivation through winter for PhD students, many of whom professed to attending as an excuse to emerge from their cellars and have a conversation with another person. It’s true, research can be a lonely process, especially when your head is stuck in a book for most of the day, so found it very useful and thoughtful that this kind of event had been organised by the University. The description of the session included elements of examining work/life balance, motivation style, stress management and mapping support systems. All in all, it was useful to recap on why we were putting ourselves through the stress of a PhD, which isn’t so much of a problem for me at the moment, but might help to reflect on the further I get into the process. One thing I particularly benefitted from was the section on motivation styles which asked a series of questions to determine whether you were driven by goals, relationships or the act of learning itself. As it turns out, my primary motivation is learning, with relationships a close second. Unsurprisingly, I scored zero for being motivated purely by goals. My interest however, came from being validated in how I get things done, as I’d always felt that ‘goal-orientated’ was somehow the right way to do things. Ever since my recent visit to the Wellcome Collection, and subsequent investigation of anatomical imagery, I’ve been interested in the mask-like quality of my work. I first started making masks as an addition to my textile sculpture, but it was as a result of a collaboration with photographer, Zeev Parush, back in 2009, that I really started thinking about the performative qualities of the objects. This also echoes my interest in relational art, which stems from a desire to create artwork that is more immersive and allows for creative interpretation by audience members, as opposed to passive consumption. In this way, research into the social context of African art, opens up new possibilities for participation within my own practice. Back to resolving the original imagery issue, I decided to use the information at hand to create a spreadsheet of characteristics including each of the basic forms and variations, specific features, materials, markings, functions, spiritual meanings and associated rituals. I’ve also been creating a few collages from magazine cut-outs, so I thought that process would make a relatively quick solution for working out mask forms and related imagery. 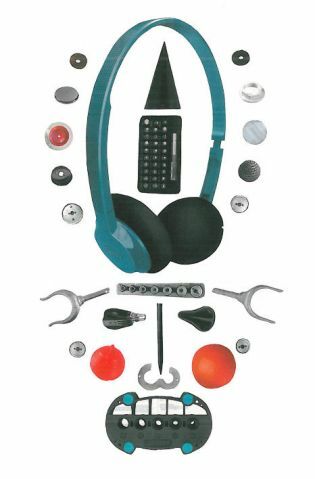 I began by selecting objects from a catalogue and arranging them so that they resembled faces. Although this work is still quite far away from my proposed outcomes, nevertheless I’m enjoying these preliminary stages, and looking forward to the associations people might between the forms and objects, as well as how the work will develop in the future. When I first applied to do the PhD, I submitted a proposal, 1000 words outlining the plan for my research and how that related to my practice. Just a few short months later, and my initial question seems to have expanded and contracted in so many different ways already. The reading, thinking about and making art, has had such a profound impact on my ideas and how I make sense of the work I’d made previously as well. The last few weeks in particular have shed a lot of light on how I might define my research question. This means that, although forcing myself to constantly question everything had initially caused some difficulties in producing work, I now feel more confident that I can justify the work I’m creating. The usual practice in defining a research question is to first construct a literature review, in order to collate previous information on the topic in question, as well as identifying any gaps in documented knowledge. 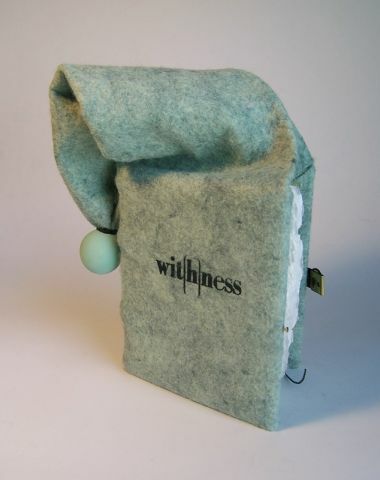 However, as my course also includes a practical element, I decided to undertake a similar exercise with artist books that had a ritual element, as I felt that would better help me to explain the work I was trying to produce. I had previously looked into the artist book resources in the University Special Collections, but at the time had been unable to put my finger on exactly what I was looking for. So decided to do some research online, in the first instance, and came across the Center for Book Arts, an amazing resource of book artists and their work. However, this now presented a dilemma. All research needs to be referenced in a way that readers can find the original source. This means that, although online resources are readily available, there is some speculation as to the credibility and permanence of the source. As one might expect, some of the links I clicked on within the Center for Book Arts archive for artists personal sites were no longer valid, so I decided to look more into the academic viewpoint on citing information from websites. One of the most important things about referencing is consistency, so, as the standard referencing system for the arts is MHRA, this was my focus. Thankfully, there is lots of information about how to structure citations using online sources, and the main issue seems to be around citing personal opinion from blogs as fact. However, given that the information about the work is provided by the maker, I’ll be looking into treating it as a mix of primary and secondary research, depending on whether or not they include their own influences. Now, comes the arduous (but exciting) task of collating the artists that I think fit with my ideas and hopefully then I can get in touch with them to find out more information about their work, after the necessary ethics training, of course.